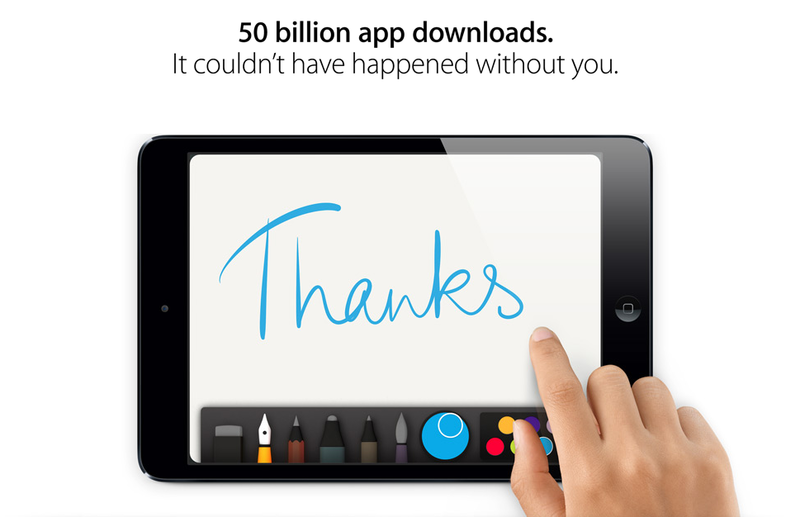 Apple on Wednesday passed the 50 billion App Store download mark, according to the countdown marker on its site. As per tradition, the company is celebrating the milestone with multiple prizes, including a $10,000 gift card awarded to the customer who downloaded the 50 billionth and 50 more $500 gift cards to the next few individuals. Apple last reported that it had hit 40 billion downloads in January of this year. That means the company saw some 10 billion downloads in just over four months, or about 78.1 million per day. At that rate, it will see 70 billion app downloads before the end of 2013, meaning it will have added 30 billion this year alone. Given that the number of downloads is accelerating, however, we wouldn’t be surprised if Apple held a second countdown, for the 75 billion mark, in time for the holiday season this year. 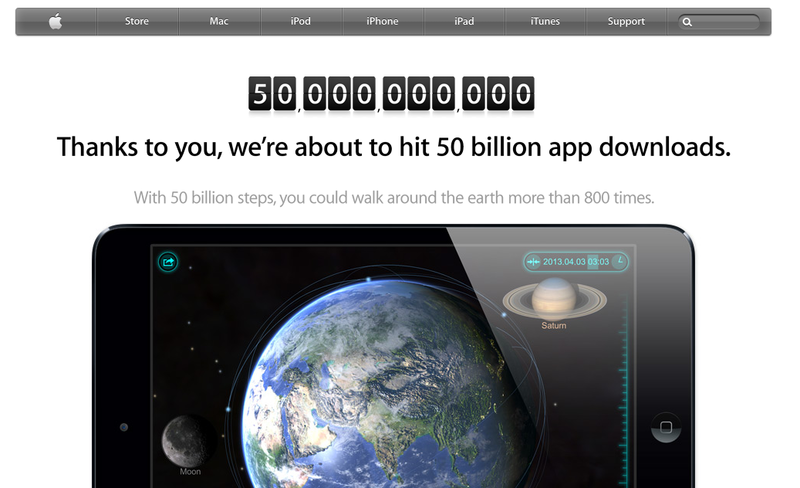 Apple held a similar countdown in March 2012, when it hit 25 billion downloads. It’s fair to say that in 2014, Apple will be celebrating a 12-digit figure. Yet Apple may not be the first to get there. Google also today shared its own figures for Google Play app downloads, and the company is gaining on Apple’s App Store: 48 billion downloaded so far, at a rate of 2.5 billion app installs per month. Given that Google Play showed up on the scene long after the App Store, and assuming it is still growing faster than its main competitor, number one and number two will soon swap spots. In fact, it’s likely this will happen before 2014, and may even occur before the fall’s iPhone update.